A small child leaves Riverside Park UMC's Rockin' Back to School event last year with a new backpack on her shoulders. She is one of thousands of children across the state to get school supplies through United Methodist churches. Photo from Beth Joyner. ‘Tis the season of the backpack - and of pancakes and prayers. As schools get ready to ring the bell on a new academic year, Florida Conference churches are planning one last day of summer fun when they hand out backpacks and school supplies to children in need. Free haircuts, eye exams and wellness checks also will get the school year started off right. And at least one church – Grace UMC, Venice -- will start a new mission with a sweet twist. This Saturday, Aug. 9, a Back to School Pancakes and Prayers breakfast will pair adult volunteers with school-age children from the church’s Kids Club. Each adult will be a prayer partner for a child, offering daily prayers throughout the school year. "I was trying to come up with a meaningful back-to-school program," says Vicki Mackey, children’s ministry director at Grace. "I've gotten a lot of positive response that it is a good idea to connect the older generation with the younger generation." Other churches, including Riverside Park UMC, Jacksonville, and First UMC, Spring Hill, will stage backpack giveaways and festivals for their communities, starting this weekend. At Grace, the Kids Club counts more than 30 children in fifth grade and younger. The back-to-school breakfast is expected to be a springboard to monthly get-togethers for prayer partners and families. Special events during the year may include Pumpkins and Prayers or Pizza and Prayers, Mackey says. The idea is to provide opportunities for mentorships and friendships that may last for years. 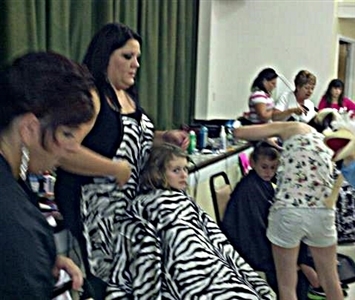 Free haircuts, above, and a chance to have fun before classes start, below, are part of the Back in the School Groove Festival at First UMC, Spring Hill. Photos from Pastor Anthony Caruana. Based on other activities and ministries, Mackey expects prayer requests to run the spectrum from practical to heartwarming. "A lot of (the prayers) are for their parents or grandparents or their friends at school who maybe get into a fight,” Mackey said, adding that prayers for help with standardized tests are common. "I leave it open to them." Mackey is still in touch with mentors she had at church growing up in Lake Wales. "That's very good to know you have people all over who love and care for you," she says. "That's an awesome experience and everybody should feel that." At Riverside Park UMC, planning is underway for the annual Rockin' Back to School event, also on Aug. 9. About 350 backpacks and bags filled separately with crayons, pens, pencils, composition books, scissors and sticky notes will be given away. But for church members, the festival also brings rewards. "Last year when we did this, I observed it was more than a giveaway," says organizer Beth Joyner. "We had fellowship among people who don't know each other. It's also an opportunity to do something that is reaching out to the community." There will be a bouncy house, snacks and a fire engine. St. Vincent's Mobile Health Outreach Ministry will do on-site immunizations and physicals for 300 to 400 children. A librarian will be on hand to sign up children for library cards. About 30 to 50 church members help out. Some attend the congregation’s traditional worship and some go to the contemporary service, Joyner says, so the backpack ministry offers an opportunity to know one another. Planning begins in March when the backpacks are ordered. The supplies are gathered around May and June. Two days before the festival, church members stuff school supplies into bags and check to be sure backpacks are in good condition. The night before, supplies are loaded into trucks for a short ride to a neighborhood park. Backpacks go out on a first-come, first-serve basis. Often there are extra bags of supplies that go to children who miss out on the backpacks. The event began three years ago when about 200 backpacks were given away. It's grown and expanded to include first- through 12th-graders and some preschool children. 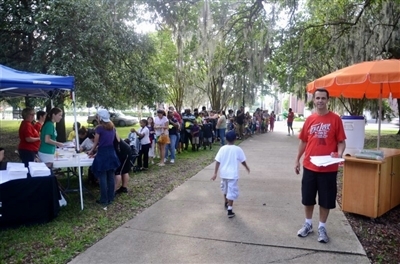 Families line up for free backpacks, school supplies and games at last year's Rockin' Back to School at Riverside Park UMC. Photo from Beth Joyner. "It's been a wonderful experience," Joyner says. "That's the touching part of it. You have so many people who are so thankful for it. You have people who get there and sit at a park bench at 7 a.m. waiting." 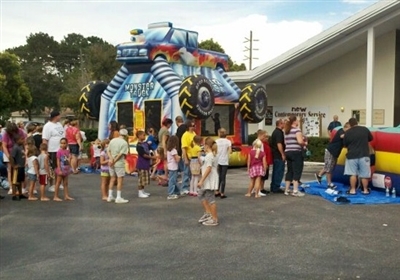 On the other side of the state, First UMC, Spring Hill, will hold its Back in the School Groove Festival for Hernando County students on Aug. 9. Activities include games, face painting by the church's clown ministry, a bouncy house, free haircuts from Bene's International School of Beauty and free eye exams. Free socks and underwear donated by the women's fellowship group at the church also will be handed out. As many as 1,000 children will receive backpacks and school supplies. About 700 backpacks are from the church, with the remainder donated by a local charity. All of the church's ministries are invited to set up display tables. Organizers also are hoping to offer wellness checks for blood pressure and a health care provider who can answer questions about prescribed medications. This is the fourth year the church has held the festival and the second year for the backpack giveaway. "We found there is a need," says assistant pastor Anthony Caruana. "Our community is very beautiful, but families are struggling." In some cases, Caruana says parents have told him they couldn't afford haircuts. "It's a big expense to them," he says. About 50 volunteers from the church and another 20 or so from the community help out. "They get something in return," Caruana says. "They say, 'That's amazing. I got something out of it, something spiritual that I can't explain.' The Holy Spirit moves the way the Holy Spirit moves."